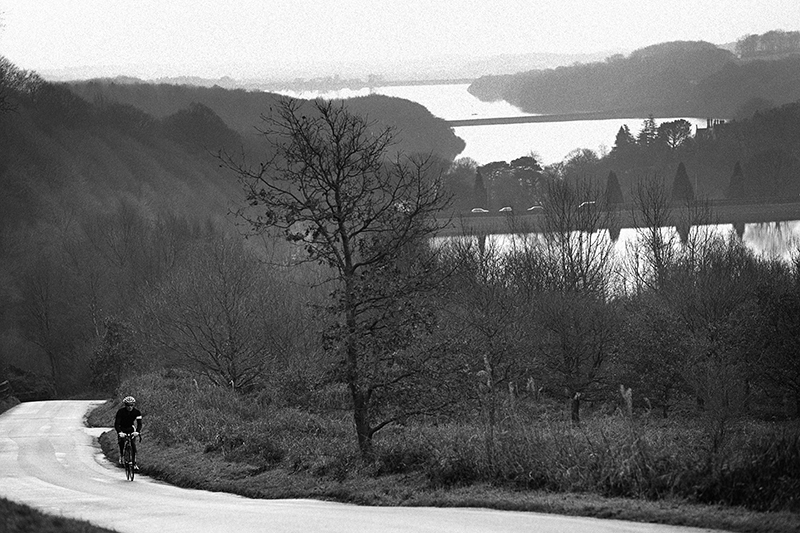 ANGLEZARKE. It sounds brutal and harsh – like the name of a viking axe or a large angry bird of prey, ready to harry you all the way home. According to the source of all knowledge – by that, we mean Wikipedia – the word ‘Anglezarke’ is a combination of “Anlaf, a form of the popular Scandinavian personal name of Olav” and the “Old Norse word erg or the Brythonic word cognate with Gaelic word àiridh (dialectal arke or argh) both meaning a ‘hill pasture or shieling”. Sometimes ‘Argh’ is just ‘Argh’ and if there is ever a hill in Lancashire that should be spelt ‘Argh’ – or even ‘Arggghhhhh’, then Anglezarke is it. I wanted to leave this hill until the April issue, as it’s 30 miles for home for me and therefore something I only visit when the weather gets better. Thankfully, one of our training mates, Dave ‘The Rocket’ Ricketts, volunteered with a joyful “I’d love to help” and, as the owner of a gold medal from last year’s Marmotte, we knew we could rely on him to climb it a few times for photos – before we nipped off to the excellent Rivington Hall Barn for a cuppa and cake, while Dave was left to ride home. Alone and unfed. 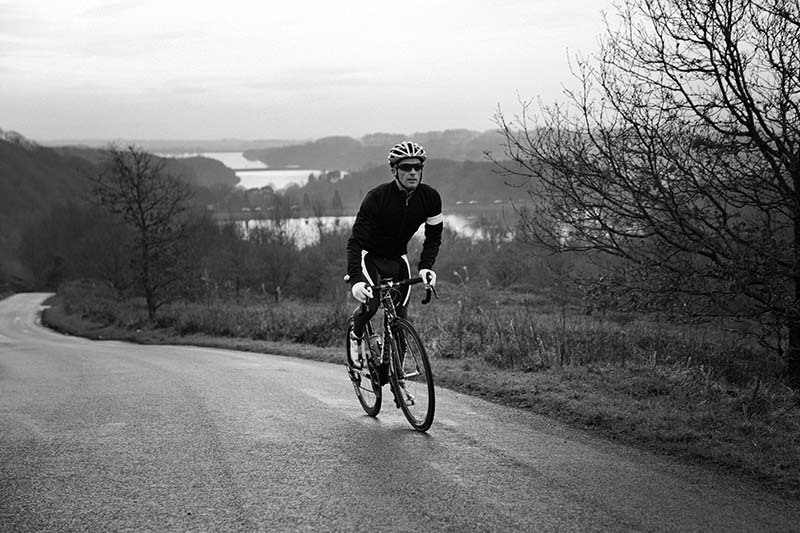 Anglezarke hill runs up the east side of Rivington reservoir, past an abandoned quarry and hills featuring old coal mine, an abandoned farm, a Bronze Age tumulus and the pathetic skeletal remains of a cyclist who collapsed and died on the hill in 2003 while trying to summit using a 39/ 23. You reach the climb by skimming down over the Rivington Reservoir, avoiding the car doors and tutting of those that like to park at reservoirs while contemplating the strain on the reservoir caused by all their on-suite bathrooms. With the rain in the past 12 months, it’s now full to overflowing but some years you can see it half empty by June. The gradient rises and you turn left at the green before beginning the considerable warm up climb straight up Sheep House Lane, over the cattle grid and first left at the top by the copse. This road takes you down to the reservoir again and you turn right this time before following the bank for 200 yards to the climb itself. 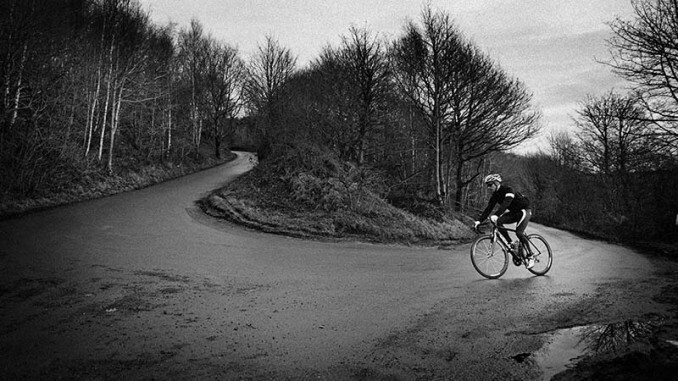 I first did this hill as a club run and one of the old hands revealed “When I scream ‘bottom gear now” I mean it…”. He wasn’t wrong. There’s a short right hand curve that takes you immediately into Moor Road and up to 26 per cent in only a couple of pedal strokes – for 75 metres. If you aren’t in a sensible gear by now, you aren’t moving fast enough to change down without stalling your gears. Remember, you can always change up if you need, so pick something very low. The climb then guides you around a left hander and continues on at then a straight at an average 8.5% for almost a mile. Outside of the peak district and maybe Quernmore over at Bowland, it’s the best way to see how your power to weight ratio is fairing, It’s just short enough to get into a reasonable rhythm if fit – and just long enough to kick you in the teeth if you’re ill prepared. With a compact and a dinner plate cog, you can sit back and twiddle this. However, if you want to test yourself and look the part, then standing up will give you a lovely old burn in the legs by the time you reach the first false summit near the car park over looking the highest reservoir basin. You can see the whole of Lancashire laid out before you here, as well as a selection for fast food packaging left by those special people who are dedicated to the UK’s most popular past time – visiting beauty spots, scattering litter and driving away again. Pushing on for another quarter mile, you’ll reach a farm on your right and then at last another right-hander for the last straight up to a sharp left-hander and the true summit. This is the traditional watering station for the Ken Hill Sportive in September, where you will be welcomed by howls of derision by a certain ex-national champ that mans the water bottles. This is a hill report with a difference – as I also want to comment on the descent. If you’re going into Chorley, the descent off Anglezarke needs a bit of care. It’s a gently twisting descent, which – when it hits the trees – takes a gentle left-hander. You’ve built up some speed by this time, but don’t be tempted to let the bike roll on at this pace. This is the right time to start feathering the brakes. The road drops quickly at this point, straight into a sharp right-hander over a stone bridge. It’s an unsighted narrow stone bridge that the pros would treat with caution on an empty road. In the years that I’ve been doing this descent, only once has the bridge been empty. Instead, there is usually some muggins either standing on the bridge gazing into the water, parking badly just on the other side or merrily wandering down the middle of the road waving a lekki stick at the surrounding hills. Dad mode now. 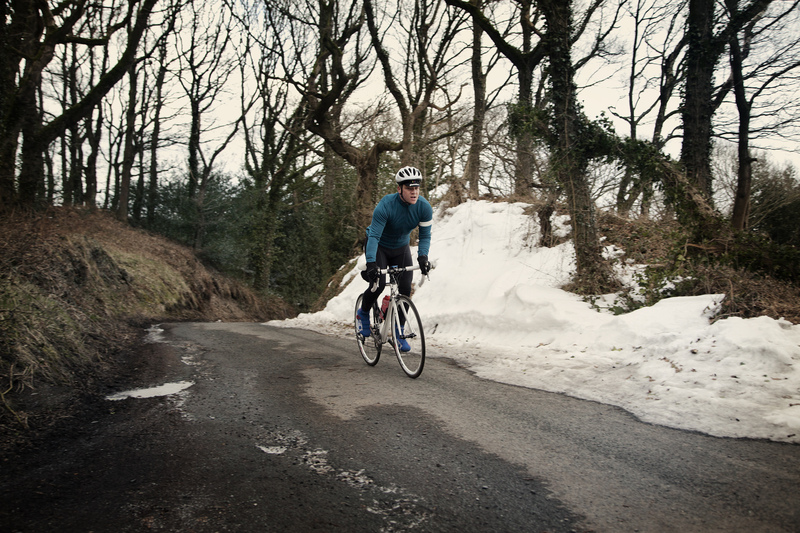 Remember, the key to all climbs is to take the descents carefully and you’ll then live to climb another day. Thank you to Dave Ricketts for tackling the climb. 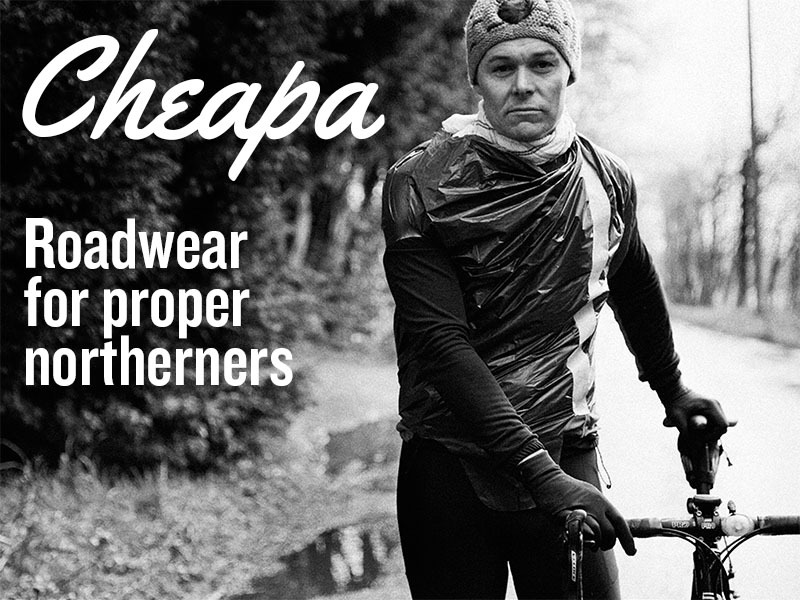 We’ve spoken to Rapha about modelling Dave, but they say you don’t look tired and gritty enough. This is one of those hills I don’t dare do unless I’m fit. It’s just far enough away from home for the fatigue to be taking it’s tole in my leg’s before I’ve even started the climb, and by the time I’ve got to the Car Park on your left, I’m always regretting trying to be a cyclist and feeling very sorry for myself! Brute of a climb, but a great one to conquer. This is a great little climb in an excellent cycling area, whats more, it goes up and then it goes down in equal measure. The whole climb/descent is mirrored at the true summit and you can tackle the descent (to the bridge at the bottom of Anglezarke resi) on your way back which, as a climb is possibly more difficult. Great as part of a rivi loop!! Hate this climb. Absolutely hate it. For extra grimness, do this then after the descent, carry on down Heapey Fold and Back Lane and then back up Sheephouse, turning right at the top and continuing up over Winter Hill to Belmont. Filth.